Good Shepherd School is one of the ministries of Good Shepherd Community Church, not a subsidiary or separate corporation. Elders rather than congregational majority govern the church. And, as with all other ministries, the Elders act as the ruling board of the school. But, as is true in any organization, different decisions are made at different levels. 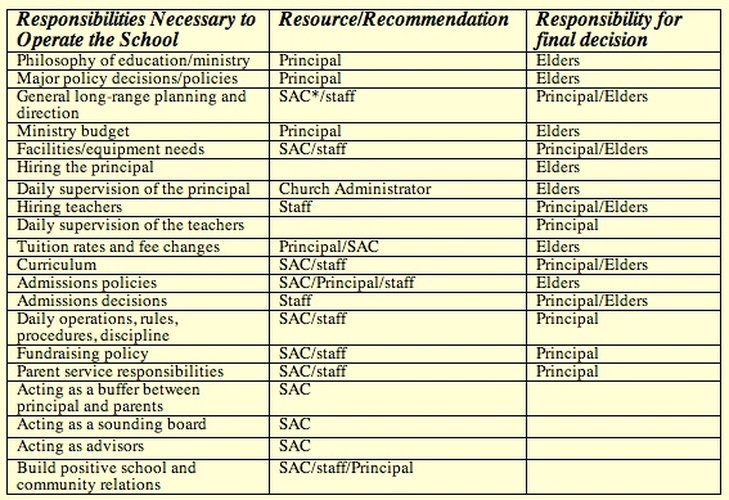 The decisions and recommendations made by the principal are often made in conjunction with the efforts and input of the teaching staff as well as the Elders and/or School Advisory Council. The role of the School Advisory Council is to provide a sounding board to the administrator, build positive school and community relations and to act as a liaison between the administration, the school and the parents. The role of the parents is to support the programs and requirements of the school and to give constructive input to the administrator or School Advisory Council when problems or concerns are discovered.